Coral reefs: Why action is needed. As the largest living structures on the planet, coral reefs are also among the greatest storehouses of biodiversity on Earth. As anybody who has had the privilege to explore coral reef ecosystems, they will tell you they are places of dazzling beauty, diversity, and are constant source of discovery and wonder, they are a treasure trove of oceanic evolutionary diversity. The importance of coral reefs, however, extends far beyond the pleasure it brings to those who explore it. Coral reefs play an essential role in everything from water filtration and fish reproduction to shore line protection and erosion prevention. They are the base of complex food webs, coral reefs support an incredible diversity of fish, Algae, soft coral, sponges and invertebrates create the base of this web. From small herbivorous fish to large predatory fish, all find food and protection on the reef. Coral reefs are some of the most precious and diverse environments on Earth, and are generally viewed as special places of wonder and awe, yet they increasingly threatened by man made activities. 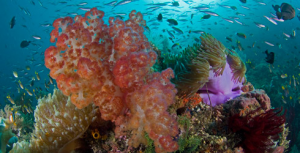 It may surprise some but few coral reefs are protected by laws of any kind and while most people would wish to see them preserved,few are aware of the increasing dangers posed by human activities. Of the major threats the most important are listed below. Ocean acidification is cause by C02 in the atmosphere which has been increasing since the start of the industrial revolution. As industrial production increases each year more C02 is concentrated in the atmosphere and some is absorbed into the worlds oceans. While this reduces the amount of green house gases the result is making the oceans more acidic. It is estimated that more than 525 billion tons of C02 have been absorbed in this way. A consequence is that the the carbonate shells of small organisms are thinned, as a result they die and cannot be a food source for the larger species who depend on them. Ocean acidification is progressively reducing the size of coral reefs. As temperatures rise in the atmosphere as a result of green houses gases, so the mean temperature of the oceans rises too. Coral organisms are extremely sensitive to water temperature and a small rise will result in mass coral `bleaching’. Coral polyps will expel the algae living within them. These algae provide the reefs with up to 80% of their energy as they die the coral is `bleached’ becoming white and lifeless. Increasingly coastal waters are becoming polluted by nearby industrial processes. When this occurs near to coral reefs the pollutants, including fertilizers, waste from industrial plants and general household waste create a toxic stew that is harmful to the delicate environment making up the coral reef. In some cases increased nitrogen levels produced by industrial processes leads to an over abundance of marine algae that can smoother a reef. Often the problems caused by waste are a direct result of increased tourism leading to coastal developments and amenities which then require increased food supplies and thus more industrial development. As indigenous peoples are increasingly brought into the global market and are required to sell their produce to whole salers traditional methods of fishing cannot provide the quantities needed as prices are depressed due to market forces. As a consequence local fishermen are turning to more destructive methods to increase their yield. These methods include using cyanide which is squirted into crevices in the reefs to incapacitate large fish, but this method kills the smaller life forms in a given area.. Dynamite is also increasingly being used and other methods such as banging the coral to drive out the larger fish. Together these methods are leading to over fishing. These problems are all a direct result of human activity and can be avoided or mitigated if we decide we want to preserve the reefs for the future. Destructive human activity is not inevitable, despite what some political economists may say, we can change our attitude if we understand the problems and express our desire to change and protect. Blue Ocean Planet, with your help will do this. Together we can help to save this most precious of ecosystems for our children and their children.